Serendipity struck Scientology when, simultaneous to actress Leah Remini's recent and very public defection from the controversial organization, a copy of William S. Burroughs exposé, Ali's Smile / Naked Scientology, came to market. It wasn't just any ol' copy. It was a Presentation Copy, Allen Ginsberg's, inscribed by Burroughs on the front wrapper, "For Allen / Love / William S. Burroughs," and signed "Allen Ginsberg aug 30, 1979 City Lights" on the half-title. The book collects the author's various newspaper and magazine essays on Scientology and the Scientology-themed short story, Ali's Smile. Burroughs joined the organization during the Sixties, took courses, and became a "clear." But soon afterward he became disenchanted with the group's authoritarian and secretive nature and left the organization in 1970. Officially expelled, he was declared by Scientology to be in a "Condition of Treason." Burroughs was initially attracted to Scientology because of its promise to liberate the mind by clearing it of traumatic memories that impeded personal growth, and, by extension, social progress and freedom from social control. His frequent collaborator, the artist Brion Gysin, introduced him to it and Burrough's "cut-up" technique in his early books reflected the influence of Hubbard's Dianetics and the fracturing of consciousness to attain a higher reality. But as his biographer Ted Morgan noted, Burroughs "… had hoped to find a method of personal emancipation and had found instead another control system." "In view of the fact that my articles and statements on Scientology may have influenced young people to associate themselves with the so called Church of Scientology, I feel an obligation to make my present views on the subject quite clear..."
"...Some of the techniques are highly valuable and warrant further study and experimentation. The E Meter is a useful device … (many variations of this instrument are possible). On the other hand I am in flat disagreement with the organizational policy. No body of knowledge needs an organizational policy. Organizational policy can only impede the advancement of knowledge. There is a basic incompatibility between any organization and freedom of thought. Suppose Newton had founded a Church of Newtonian Physics and refused to show his formula to anyone who doubted the tenets of Newtonian Physics? All organizations create organizational necessities. It is precisely organizational necessities that have prevented Scientology from obtaining the serious consideration merited by the importance of Mr. Hubbard’s discoveries. Scientologists are not prepared to accept intelligent and sometimes critical evaluation. They demand unquestioning acceptance. "Mr. Hubbard’s overtly fascist utterances (China is the real threat to world peace, Scientology is protecting the home, the church, the family, decent morals … positively no wife swapping. It’s a dirty Communist trick … national boundaries, the concepts of RIGHT and WRONG against evil free thinking psychiatrist) can hardly recommend him to the militant students. Certainly it is time for the Scientologists to come out in plain English on one side or the other, if they expect the trust and support of young people. Which side are you on Hubbard, which side are you on?" (Burroughs On Scientology, Los Angeles Free Press, March 6, 1970, reprinted in Ali's Smile / Naked Scientology). 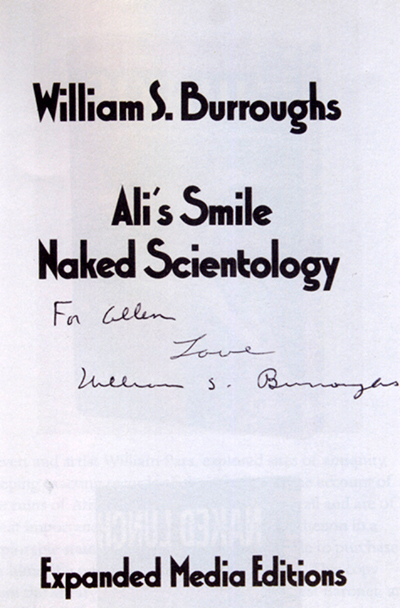 That Burroughs presented this copy of Ali's Smile / Naked Scientology to Allen Ginsberg is of no little significance. Burroughs had been proselytizing to his friend about Scientology as early as 1959. In a letter to Ginsberg dated October 27 of that year he wrote: "The method of directed recall is the method of Scientology. You will recall I wrote urging you to contact local chapter and find an auditor. They do the job without hypnosis or drugs, simply run the tape back and forth until the trauma is wiped off. It works. I have used the method - partially responsible for recent changes." Ginsberg was also concerned with personal liberation and freedom from social totalitarianism. With this copy of Ali's Smile / Naked Scientology Burroughs presented Ginsberg with his conclusions about the group and his deep concerns, which can be neatly summarized in a line from The Who's We Won't Get Fooled Again, "Meet the new boss, same as the old boss." Dogma, orthodoxy, and authoritarian control were antithetical to everything Burroughs and Ginsberg stood for. BURROUGHS, William S. Ali's Smile Naked Scientology. Bonn: Expanded Media Editions, 1978. First collected edition of previously published work, first printing in wrappers, a Presentation Copy inscribed to Allen Ginsberg. Octavo. 106,  pp., text in German and English, translations by Carl Weissner. Pictorial wrappers. What an intelligent man, born before his time, must read the book! So many books have been written about the cult of scientology I have a feeling this must be one of the best. What a great find. I recently enjoyed Scientologist! William S. Burroughs and the Weird Cult which amazed me because I never thought for a minute that Burroughs was so "into" it. "China is the real threat to world peace"
L.Ron Hubbard - quoted above. L. Ron Hubbard never wanted his "technology" dissected by non-invested, critical thinkers or actual scientists. "Scientologists are not prepared to accept intelligent and sometimes critical evaluation. They demand unquestioning acceptance."